Posted December 28, 2017 by admin & filed under Family Dental Care, General Dentistry, Invisalign. As we start the New Year, people are always making resolutions to better themselves, but I rarely hear resolutions from people vowing to improve their smiles. Your smile is important – it’s one of the first things that people notice about you. In fact, the Academy of General Dentistry reports that 40 percent of survey respondents notice a smile first in people they work with, and 96 percent believe that a smile is important to a person’s appearance. In other words, it’s one of the first things that people remember while thinking about you. This can impact your friends and your work relationships. In fact, if you have frequent business meetings, it’s practically necessary for you to have a gleaming smile. Let’s be realistic, while you may have had a perfect smile when you were younger, as the years kept moving on, your smile probably started to falter. If you drink coffee and/or wine, or smoke, stains on your teeth can fade those pearly whites to a grayish tint. Maybe your teeth have moved out of alignment, so they’re not straight any more. Or maybe you had some issues and have visibly damaged teeth or you might be missing some teeth. All of these things can damage your smile, and your self-image. In addition, any one of these things can make you look older, and the more you have, the older you’ll look. Fortunately, there’s something you can do to fix these issues. Every one of these issues can be easily solved by a good dentist. In fact, I do it so often I just call it a Smile Makeover (#SmileMakeover). (I’ve even done it on a local TV station!) These are the cases that can bring a huge smile to my face, and often, make EVERYBODY in the office tear-up. After all, it can be a very positive life-changing experience. Stained teeth can be whitened during one visit. It’s really quite simple. Make an appointment, show up, and an hour later, you’re leaving with pearly white teeth again. Crooked teeth can be fixed with Invisalign. Just look at these photos to see the results. Also, since Invisalign is transparent, most people won’t even know that you’re wearing them. Damaged or fractured teeth might require porcelain crowns. These essentially go over what’s left of your old tooth, and when done right, nobody will even know that they’re porcelain. deteriorating. 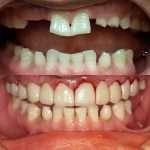 In addition, you can treat them just like your natural teeth, and you’ll never need to worry about hiding your smile again. Just look at these photos to see how great your smile can look. And if you want a Smile Makeover to give you a new smile for the new year, call one of my Concord dental offices below to ask about our special pricing and schedule a free consultation. I’ll be happy to give you the perfect smile you’ve always wanted.